Be-Barefoot: Will Raw Milk be the next Moonshine? They say patience is the companion of wisdom... on our farm we have a wise goat and a very patient yet persistent little milker. This is the lifestyle I used to only dream about. I remember flying all over for the "job" and wishing I could just be at home on the farm. Today I'm so thankful for the opportunity to live life as I so clearly pictured in my mind. I am able to live my dream lifestyle because I partnered with a really good stable 56 yr old company called, "Shaklee"
Do you have a dream you would like to accomplish? Here's a cute and funny video raises awareness that could possibly turn into a BIG issue in North America. As folks decide to fight for the freedom to choose nutrient dense and raw unprocessed milk. 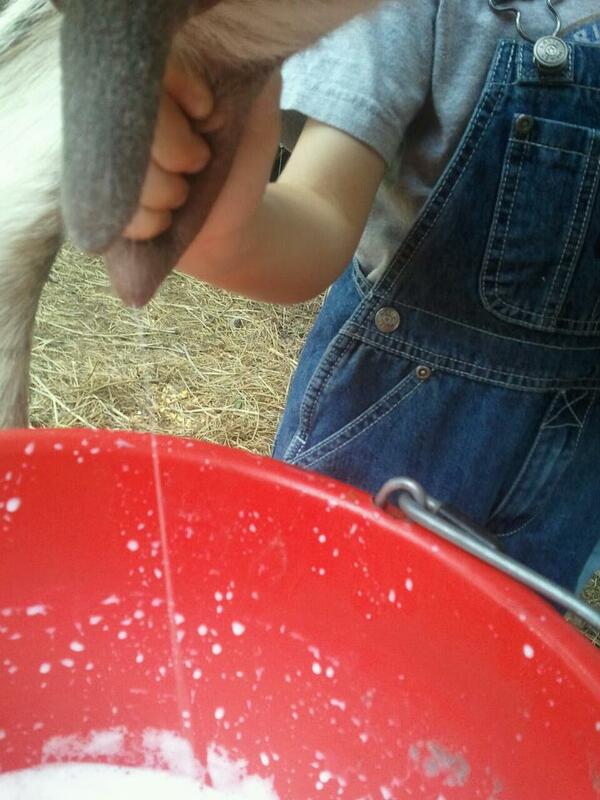 To be honest I didn't realize the health benefits of raw milk until we purchased a couple of nanny goats.We orginially purchased them to help keep everything trimmed around the farm. (at least that was my excuse to get em) We bred them to have the experience of cute little kids running around to play with. The researcher in me kicked in and I started learning the health benefits of raw milk! It wasn't long before we sold the babies and started experiencing the benefits of having as much fresh raw milk as we could possibly use on the farm. I've gotta say there is nothing better than a smoothie made with fresh raw goats milk. After making home made yogurt and realizing how much sweetener is put in commercial store bought yogurt I don't plan on consuming it again anytime soon. I even saw an article on pinterest for using raw milk as a treatment for pink eye. Natural raw unprocessed milk has the "good" bacteria (probiotics) that is killed off when milk is pasturized. It's the "good" bacteria that will help your body naturally fight off viruses, infection etc.. by boosting your immune system. So what do you think? Could Raw Milk be the next Moonshine? It seems from what I've read, in several different places, that Raw Milk "already is" being treated by big-brother like Moonshine was during prohibition.